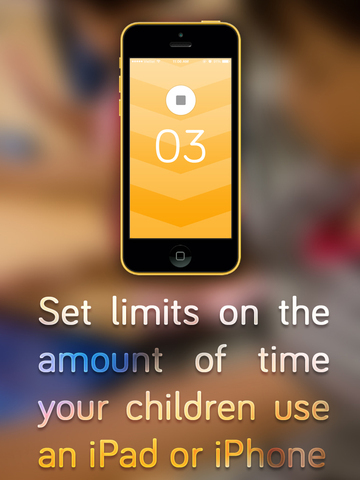 ScreenTimer is a simple app that allows you to set limits on the amount of time children use an iPhone or iPad. Set a time length, press start and pass it to you children. After the time expires, a series of audio, visual and on-screen notifications will discourage your children from using the device until you enter the correct passcode. After time elapses, the device will receive a series notifications alerting your child that their "Screen Time is up!". These notification will continue, discouraging a child from using the device until the passcode is correctly entered. They will have to return the device to your to enter the passcode. 2. Set the user by tapping on user names in the upper left of the screen. You will be prompted to add a user name before beginning the first run. 4. Pass your iPhone or iPad to your child and let them use the phone any way you choose (e.g. apps, movies, music). 5. ScreenTimer runs in background and keeps track of how much time has expired. You can get an approximation of how much time is remaining in the current session by switching to multi-tasking mode in iOS 7. – Double-click the ‘Home’ button on the device to display recently used apps. – ScreenTimer will show you the minutes remaining on the application screenshot. After your predetermined time, a series of alerts and notification will play alerting the child that their screen time is up. – Continuous notifications will be presented on the device (similar to text messages). This will temporarily disrupt the child’s activity on the device. Notifications continue to fire even in they child taps ‘Cancel’. For best results (e.g. the most disruptive to the child), change the notification types to ‘Alert’ style using iOS’ Setting.app. 1. Launch ScreenTimer. You can launch it directly from a notification by tapping on it. 2. Enter your passcode to stop all the notifications. To assist with understanding and managing your children’s screen time, the application allows you to set up users so you can track different users on the save device. For best results (e.g. the most disruptive to the child), change the notification types to ‘Alert’ style using iOS’ Setting.app.